A former board member of Gospel for Asia Canada is alleging that he was illegally dismissed by board president and GFA International Director K.P. Yohannan. Garry Cluley asked the Canadian Revenue Agency (CRA) to investigate the recent dismissal of two Gospel for Asia Canada board members. In an alleged violation of GFA’s bylaws and Canadian law regarding charities, former Board member Garry Cluley was dismissed by Yohannan via letter dated December 8, 2015. 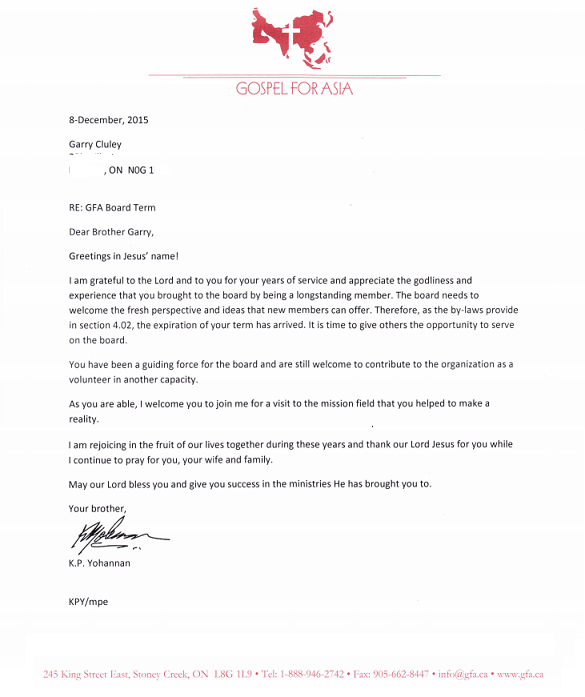 In the letter (see below), Yohannan stated that Cluley’s term of service was up and he was being dismissed because “The Board needs to welcome the fresh perspective and ideas that new members can offer.” GFA’s bylaws nor Canadian law regarding charities provide for dismissal of a director without due process of board action. Cluley alleges that his dismissal was not allowed by law and occurred as he was asking for financial statements and GFA’s joint ministry agreement. I, Garry Cluley, became a board member in 2013. I understand that you will be sending the joint ministry agreement and the audits and that you will be sending them by registered mail. Again, thank you for your time, and for your work for God. The next day, December 9th, I received a letter via email from KP Yohannan, the chairman of our board and president, informing me that I had been dismissed from the board. A copy of the letter is attached. I have only been on the board for two years therefore the claim of a need for a “fresh perspective” seems disingenuous. I believe that the true reason for his action is that he does not want me to see the joint-ministry agreement or their associated financial statements and audits. The same day Cluley was told he would get the GFA documents, a letter dismissing Cluley was written by K.P. Yohannan. That letter is below (see a pdf of it here). As Cluley noted, he had only been on the board since late 2013. Furthermore, the GFA Canada bylaws do not define a board member’s term. Cluley was not informed of any board action or meeting for the purpose of deciding his fate as a board member. Although the CRA has not responded at this writing about the possibility of an investigation, the basis for a government inquiry appears sound. Based on the documents I have seen (more documents are available at the end of the post), it appears that Cluley attempted to fulfill his fiduciary responsibility as a board member by looking into allegations against GFA. He was stonewalled by his own organization and then when he refused to stand down, he was dismissed in apparent violation of GFA’s bylaws and Canadian law. I spoke with Cluley yesterday and he informed me that the remaining board member not named Yohannan told him there was no board meeting to dismiss the Cluley. It seems highly unlikely that a board meeting to dismiss Cluley took place. On December 8, Cluley was promised documents by Canadian director Pat Emerick and then also on December 8, a letter was prepared by K.P. Yohannan dismissing Cluley from the board. Cluley has also contacted GFA’s U.S. board of directors regarding his dismissal with no reply from them. I call on GFA to explain why Garry Cluley and Rob Thiessen were dismissed and to provide a legal basis for the action. Gospel for Asia Canada Bylaws, formative documents and Canadian regulations. — As Cluley noted in his letter to the CRA, there is no bylaw 4.02 in the bylaws. Nothing in the Canadian law nor in the bylaws allow the removal of a board member the way K.P. Yohannan did it. Memo from Garry Cluley to the US Board – The US board is sitting on their hands without comment or response to Cluley about this allegedly illegal action.